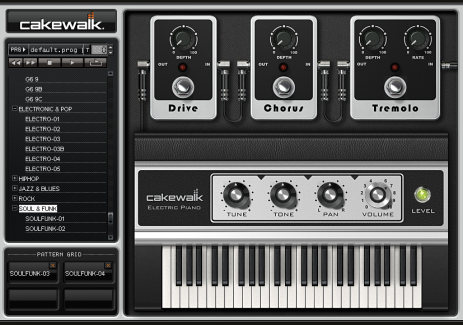 Cakewalk TTS-1 is a GM2 (General MIDI 2) compatible, multi-timbral, multi-output, software synthesizer featuring a newly developed software synthesis engine, with 256 sounds and 9 drum sets built in. For more information, see the Cakewalk TTS-1 online Help. Figure 1123. Studio Instruments Bass Guitar. 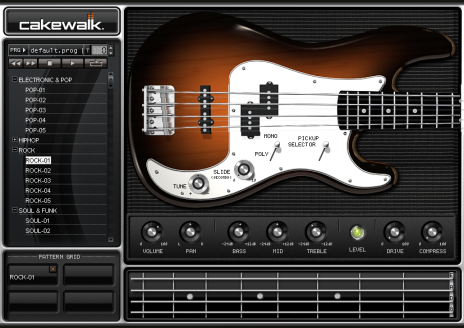 Bass Guitar accurately replicates the sound of a classic electric bass guitar sound and features a highly-detailed user interface as well as simple but powerful controls. It uses Cakewalk’s patented and acclaimed Expression Engine technology, an anti-aliased, real-time sound production system for multi-sample audio playback. For more information, see the Studio Instruments Bass Guitar online Help. Figure 1124. Studio Instruments Drum Kit. 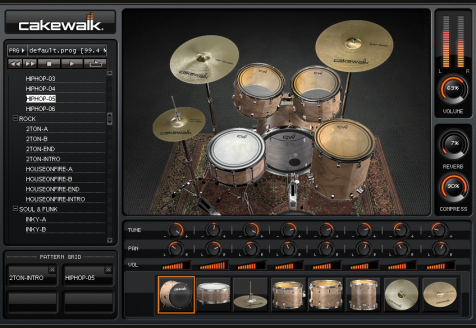 Drum Kit accurately replicates the sound of its real-world counterpart and features a highly-detailed user interface as well as simple but powerful controls. It uses Cakewalk’s patented and acclaimed Expression Engine technology, an anti-aliased, real-time sound production system for multi-sample audio playback. For more information, see the Studio Instruments Drum Kit online Help. Figure 1125. Studio Instruments Electric Piano. Electric Piano accurately recreates the classic Fender Rhodes electric piano sound and features a highly-detailed user interface as well as simple but powerful controls. It uses Cakewalk’s patented and acclaimed Expression Engine technology, an anti-aliased, real-time sound production system for multi-sample audio playback. For more information, see the Studio Instruments Electric Piano online Help. Figure 1126. Studio Instruments String Section. 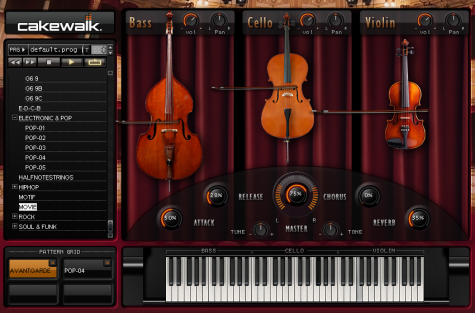 String Section offers three types of classical string instruments—Violins, Cellos and Basses—and features a highly-detailed user interface as well as simple but powerful controls. 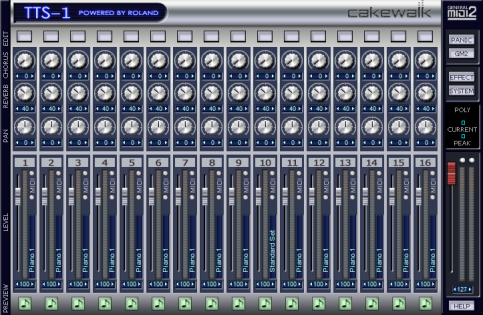 It uses Cakewalk’s patented and acclaimed Expression Engine technology, an anti-aliased, real-time sound production system for multi-sample audio playback. For more information, see the Studio Instruments String Section online Help.